of your musical interests or skill level! Steve's methods, developed over the course of 40+ years of guitar experience, make learning to play the guitar (or improving upon your guitar playing skills) a fun and exciting journey. Years of study on his own and with some of the country's most talented and skilled player/educators (Berklee College of Music, California State University Los Angeles and Mason Gross School of the Arts at Rutgers University) have given him a clear sense of what works...and what doesn't. Having taught hundreds of students on both sides of the country, he has developed a sensitivity to the individual needs of his students and is able to plot a course based upon those unique needs and skill levels. For a number of years Steve taught at Hanich Music Complex in southern California where he also conducted guitar seminars as part of an educational series that included players such as Tommy Tedesco, Lee Ritenour, Phil Upchurch and Larry Carlton. All levels are welcome, from absolute beginner to advanced. Call 908-578-4963 for more information and availability or send Steve a message. 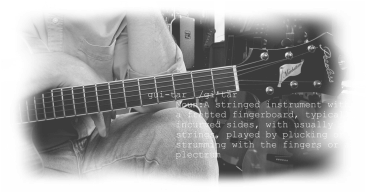 Steve teaches guitar lessons in his studio in Herndon, Virginia - conveniently located within 35 minutes of DC, Falls Church, Reston, Annandale and Alexandria. In-home lessons are also available. Music and materials may be required or provided. Please bring your previous materials (if available) for review. Lessons are weekly and payable monthly in advance via cash or check. a credit will be applied to the following month. "Steve is an attentive and generous teacher. He brings a lot of experience to his teaching, and also goes well beyond the typical teaching approach. For example, when working on a particular jazz tune, he would find online examples of exemplary performances of the tune, so that I could see how great players handled it. He takes the time to understand where the student is in their playing and their interests, and provides good and challenging material that is tailored to what they want and need. Much of what he provides is hand written by him to address the specific musical problems that I needed to work on. He is also very patient and good humored, so lessons were something to look forward to. I highly recommend him as a guitar teacher for any level of student." "I retired in March 2010 and in the Fall of 2011 I decided to pursue one item on my "bucket list" - learn to play the acoustic guitar. I researched a number of potential instructors and chose Steve for a few reasons and to date and I am extremely pleased. First, Steve has the experience as a professional musician. Second, Steve framed my "journey" to learn the guitar. The "framing" includes him listening to what I want to learn and then developing lesson plans that fit my skill level. Lastly, I've appreciated Steve's patience, encouragement, and overall optimistic nature. Steve's teaching style emphasizes a fun learning experience at my own pace. My "journey" to learn guitar is just beginning and I'm glad I chose Steve to guide and steer me on my way to a lifetime of enjoyment." "To date I really appreciate what you have taught me. You were spot on at the first lesson - learning the guitar is a journey. Thus far I have learned that I can learn to play the guitar (with a lot of practice and guidance), it is a journey, I must be patient, and learning and playing a guitar is enjoyable! Again, thanks for your support on my journey to learn guitar!" "Steve establishes a relaxed atmosphere at lessons. He has balanced theory and exercises with making real music. He is knowledgeable and helps me to understand what I'm trying to play making it easier, in the end, to learn new pieces. Perhaps the best thing I can say is that the lesson time seems to pass far too quickly." "Steve Killian is the reason I’ll be playing guitar for many years to come. I’ve made several attempts at learning to play either with friends, or through professional instruction and each time I found myself losing interest. Then I met Steve. In the first few weeks under his guidance, I’ve learned more about the guitar and taken more pleasure from the learning and practice than I ever imagined possible. Steve’s musical knowledge and experience is vast, but what makes him unique is his ability to creatively communicate that experience and knowledge to his students based on their individual needs and goals. Steve is truly a unique instructor and I highly recommend him for students of all levels."